I really think next week might be a TBC especially because the week after there is no episode because of the survivor finale, plus there are 6 episodes left and 6 teams left. No peach remember ? It's for you to post not me. *Two Teams test their rocky relationships on the choppy waters of Croatia with very different results. *An oversight threatens major repercussions for an otherwise strong Team. *It's "the cherry on top of the ice cream sundae that's already melted" according to one Team, when Phil gives them some news at the Pit Stop. My theory is that this is said by the first place team at the mat when they're given their next clue and told to "continue racing." What puddin is referring to is my very first tip that led us to Croatia this season. I was given a head's up that a TAR "technical Person" had just returned home from Croatia after being released early because "his team had been eliminated". So we are thinking that this may not be a TBC this week. But then you read a comment like that and you start to wonder all over again!! I really want to get this TBC out of the way so I can relax!! I'm thinking India--Monsoons would make a great TBC place but thats for another thread. so are Nate and Jen in the bunch of racers at the front or the bunch at the back. I'm with you Puddin for a TBC in India,a long train ride. so in the next 5 episodes we will need to fit 2 NEL's and if going from Peach's evidence Croatia isn't one. I'm thinking that the TBC does fit nicely into our Dubrovnik spoiler info. It would be easy for the race to continue onto Split, Croatia. We've got 'sourced' picture of the place, so why not? Lets say the lead teams have roughly a 5 hour advantage/lead ..how do TPTB equalize them IF this is a TBC? I dunno, i can't wrap my brain around it. 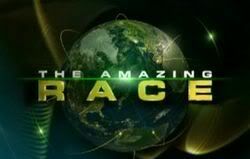 "Cherry on Top of the Sundae That's Already Melted" - One Team falls apart during a Detour in Croatia that requires precise teamwork, while one of the Race's strongest Teams makes a costly mistake that threatens their future, on THE AMAZING RACE 12, Sunday, Dec. 9 (8:00-9:00 PM, ET/PT) on the CBS Television Network. I think that it's the sibling because TK&Rachel screw up half the thing that they do so it's nothing special if it's them. anyway we know that the siblings are lagging behind so they must f*cked something up. I think that this will be an elimination round and the next two rounds will be TBC. if it does I really hope that the siblings will be eliminated and not grandpa. I'm liking Gramps slow and steady ways, I love him! I hope they are not decoys in Alaska and very well could win, that would be a surprise! When does CBS usually put the trailer up on their website?